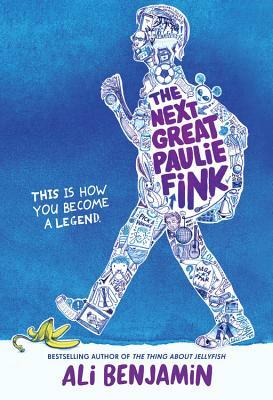 In this acclaimed novel by the author of the award-winning, bestselling The Thing About Jellyfish, being the new kid at school isn't easy, especially when you have to follow in the footsteps of a classroom prankster like Paulie Fink. When Caitlyn Breen begins her disorienting new life at the rural Mitchell School--where the students take care of real live goats and study long-dead philosophers, and where there are only ten other students in the entire seventh grade--it seems like nobody can stop talking about some kid named Paulie Fink. Depending on whom you ask, Paulie was either a hilarious class clown, a relentless troublemaker, a hapless klutz, or an evil genius. One thing's for sure, though: The kid was totally legendary. Now he's disappeared, and Caitlyn finds herself leading a reality-show-style competition to find the school's next great Paulie Fink. With each challenge, Caitlyn struggles to understand a person she never met...but it's what she discovers about herself that most surprises her. Told in multiple voices, interviews, and documents, this funny, thought-provoking novel from the bestselling author of The Thing About Jellyfish is a memorable exploration of what makes a hero--and if anyone, or anything, is truly what it seems. Ali Benjamin is a New York Times bestselling author and National Book Award Finalist for The Thing About Jellyfish, and the co-writer for HIV-positive teen Paige Rawl's coming-of-age memoir Positive as well as Tim Howard's national bestseller The Keeper. She lives near Williamstown, Massachusetts. * "A story with massive heart... A book to make readers think, question, reach, laugh, and strive harder." * "Genuinely original, the novel offers thoughtful perspectives on friendship, accepting change, and the many rewarding guises of storytelling, as well as a fully gratifying ending that the characters don't see coming." goofy, often physical comedy...with introspection...for a look at shifting middle-school identities and the strange chaos they bring." *"A painful story smartly told, Benjamin's first solo novel has appeal well beyond a middle school audience."